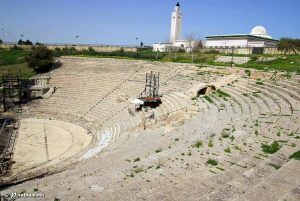 Roman North Africa: This is the amphitheater in ancient Carthage where Romans killed Christians during the Decian persecution. By the 300s BC, the North African port of Carthage was actively engaged in policing the whole Mediterranean. Carthage made treaties, for instance, with the Etruscans in Italy, to protect the Etruscans from piracy from the Greeks in southern Italy. And Carthage fought constant wars with the Greeks in Sicily over who would control which parts of Sicily. But by the 200s BC, Carthage got into a war with the growing Roman Empire over who would control the Mediterranean. The Romans wanted to take over the police work. In the first of the Punic Wars, the Romans succeeded in taking all of Sicily away from Carthage. Then in the second Punic War, which ended in 202 BC, the Romans got control of Spain as well, and really reduced Carthage to a very weak country. In the third Punic War, in 146 BC, the Romans destroyed Carthage altogether, and took over control of North Africa. For a hundred years, Carthage was very weak. But under Julius Caesar about 50 BC, and then under later Roman Emperors, Carthage was refounded as a Roman city. North Africa became an important part of the Roman Empire, exporting wheat and olive oil and pottery all over the western half of the Roman Empire, and as far away as Iran and India. This trade continued even through the 400s AD, when the Vandals conquered North Africa and set up their own kingdom there. The Young Carthaginian by G. A. Henty (1860s, reprinted 2001) This is a good adventure story that can introduce you to the wars between Rome and Carthage, but because it was written more than 100 years ago, it has some racist and unfair assumptions about the Romans being better people than the Carthaginians – watch out! Cite this page: Carr, K.E. Roman North Africa – Carthage to Augustine. Quatr.us Study Guides, October 3, 2017. Web. April 20, 2019.